I think that a question that is asked often by anyone with a bit of drive is, how on earth do you come up with a good idea? How did Charles Darwin, or Steve Jobs, or Hedy Lamarr come up with the ground breaking ideas and technology that they are credited with. If there is a single maxim that runs though this book’s arguments, it is that we are often better served by connecting ideas than we are by protecting them. As Johnson begins to really dig into his points, he introduces us to an idea he calls the adjacent possible. I kept thinking of it as the idea that we stand on the shoulders of those that went before us. These people that went before us gave us a platform (Chapter VII) so we can now take the next step and invent the thing we’ll contribute to the platform. You can see this idea in evidence in scientific discovery as many people “discover” the same thing within a very short window across the globe. Then the six following chapters are all about how we can best get more parts on the table to bring more into the adjacent possible. The first way that we can get those new ideas on the table to build with is by participating in a liquid network. This phrase is taken from the fact that liquid conducts electricity and in that liquid you can stimulate a single neuron but across the liquid a second one is stimulated. Johnson looks at the city as one of the prime examples of a liquid network. It allows people to specialize and thus expand their knowledge down a particular field. Then this knowledge is intermingled with others inside the network and, voila, we have a combination of ideas that bring some invention with parts from different fields. A few weekends ago I watched Valley Uprising, and in that we see this evidenced as well in the competition between Royal Robbins and Warren Harding. They had different ideas about how to climb and their ideas collided off each other to drive each of them to better heights. There was also Yvon Chouinard there, a good climber in his own right, who founded what is now Black Diamond1. He also used the different ideas of all the climbers in Yosemite Valley to push the gear forward that they climbed on. All of the ideas mashed around together and we have some very iconic companies in Patagonia2 and Black Diamond. While Johnson does liken cities and the free interchange of ideas to a primordial soup which is an “ideal” to generate new things, he does caution against the blanket open office. He says that the standard open office is not what business should aim for because it brings mere distraction. They should be looking for configurable office solutions that let teams form around projects and then disband and form again in new configurations as the projects that interest them demand. The next way that Johnson suggest we get more ideas on the table to work with is via the “slow hunch”. This is the idea that our ideas don’t leap fully formed, but take time to develop from the initial barely existent spark into an idea that can blaze its own path. And so most great ideas first take shape in partial incomplete form. They have the seeds of something profound, but they lack a key element that can turn the hunch into something truly powerful. And more often than not, that missing element is somewhere else, living as another hunch in another person’s head. Johnson says that these ideas are hard to put a finger on though. Most hunches that turn into important innovations unfold over much longer timeframes. They start with a vague, hard-to-describe sense that there’s an interesting solution to a problem that hasn’t yet been proposed, and they linger in the shadows of the mind, sometimes for decades, assembling new connections and gaining strength. How do we write it down (digital or analogue)? How do we find old “murky” ideas when we think they connect to something else? Johnson doesn’t provide us with many answers here outside of saying that he uses DevonThink and it’s “see also” feature to connect ideas that are stored in his “digital brain”3. Serendipity is the next key to getting more on the table to work with. You simply need more material in your brain if you want to be able to connect ideas in your own internal liquid network. For this Johnson recommends reading widely across genre’s and looking at other recommendations to get into fields that you may not have any more than a vague awareness of. He also says that we need time to think if we want to be able to connect these ideas. Some of you will say that you don’t have time to read, or that you don’t have enough time. Johnson addresses this “reading at the edge” by taking a page from Bill Gates, who does a 2 week reading vacation. He suggests you take a vacation like this so that you can have a large amount of varied ideas in your head in short order. While this is a decent idea, there are so many people that don’t have time to read outside of fits and starts in the day. They couldn’t afford to take two weeks off work, or there will be no food to eat at the end. If this is you, then having a regular reading practice is good. Spend 10, 20, 30, or whatever minutes you have in the day reading every day. Keep expanding your field of knowledge if you want to be able to draw strong connections across fields. One thing that feels a bit funny is his faith in the Google algorithm. He figures that you type it in and get most of the research you need easily. We’re much more conscious now that searching suffers from confirmation bias so I don’t put as much stock in a basic search. 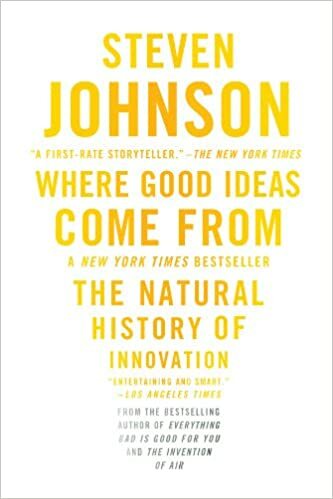 To be well informed and “stumble” across ideas that might connect we need to be more intentional than Johnson assumes in 2010 when he wrote the book. Error comes into building good ideas when we can filter out the true errors from the results we just didn’t expect. Think of penicillin, which was a contaminated experiment. What if it was just thrown out because of the contamination? I’m sure antibiotics would have come along again, but how many more lives would have been lost first? A good idea has to be correct on some basic level, and we value good ideas because they tend to have a high signal-to-noise ration. But that doesn’t mean you want to cultivate those ideas in noise-free environments, because noise-free environments end up being too sterile and predictable in their output. The best innovation labs are always a little contaminated. That “contaminated” environment sounds very much like a liquid network to me. In fact near the end of this chapter he talks about conferences and meetings with colleagues across disciplines being great because they may see the noise in a different light and bring a new idea to the table. That’s serendipity and liquid networks in action, plus a bit of exaptation which we’ll cover in the next chapter. Exaptation is the idea in evolution that a trait evolves for one purpose, but then is used for another purpose. The example presented is feathers, which they figured were for warmth originally. They just happened to be good for gliding and then flying. Another example is punch cards which were first used to “program” looms in the 1800’s. Punch cards were a staple of programming computers as recently as the 1970’s. The idea for the loom turned out to be useful for other things as yet unimagined. Cities, then, are environments that are ripe for exaptation, because they cultivate specialized skills and interests, and they create a liquid network where information can leak out of those subcultures, and influence their neighbors in surprising ways. On a personal level Johnson says that having varied hobbies that have nothing to do with your main line of work. These hobbies will bring skills to bear across disciplines that make result in a new idea. It’s like building your own little liquid network around you. The final place that Johnson says grow good ideas is platforms. Think The Homebrew Computer Club, which had members from many of the big tech giants of the last number of decades. You could also think of the invention of the web, without which we wouldn’t have YouTube or the blog your reading. To get these things we have now, someone had to develop the platform of the web first. Again, this felt like a different face of the same idea as Johnson threaded the idea of liquid networks, and slow hunches throughout platforms. He says you may have a slow hunch, but then the platform emerges and you have that flash that ties it together with what you just found out from your liquid network. For every Alfred Nobel, inventing dynamite in secret in the suburbs of Stockholm, there are half a dozen collective inventions like the vacuum tube or the television, whose existence depended upon multiple firms driven by profit motive who managed to create significant new product via decentralized networking. Johnson finishes the book by addressing his fourth quadrant, which took a bit to figure out what it is. According to Johnson the fourth quadrant is the freely shared information in the world. It’s a liquid network, and serendipity all rolled into one. The fourth quadrant is not patents and lawyers because they stop ideas from flowing freely to be built upon. One of the big places that Johnson says is a fourth quadrant source of information is academia because all you have to do is provide a footnote and you can build on any idea you want. While this may be true for those inside the academic walls, I live the frustration of trying to get access to studies that are behind paywalls. Last year I added up the paywalls I’d need to pay for to get the research I wanted to access that day and it totalled almost $10k I’d need to pay every year to maintain access to the research fields I’m interested in. Yes it would be cheaper for me to pay yearly for some online class and never do the work to get access to journal articles through a university. This doesn’t seem like a fourth quadrant source of information then unless your inside the blessed walled garden or are willing to use services like sci-hub. Should I Read Where Good Ideas Come From? Before we dive into the recommendation, let’s address something I didn’t realize until I went to write the introduction. Where Johnson cites many male inventors, he doesn’t cite many women? It’s possible that there are no female inventors cited. I couldn’t remember any as I wracked my brain, or in 15 minutes leafing back through the book to find a name for the introduction. It would be interesting to note which extra ways Johnson would cite if he included more female inventors in his research. I wonder if some of them would not exist, or maybe if academia as a solid fourth quadrant research area would fall because women are under represented at the teaching level4 and thus have less access to this method of idea dissemination. Finally, I’ve already made mention in my review that some of the chapters and content felt like repeat, or two very similar sides of the same coin. I wasn’t annoyed by this during the reading, nor did I feel like I was wasting my time reading the same idea over and over. If you’re looking to build a better network so that you can generate good ideas, then Where Good Ideas Come From is a great book. Even outside of that, there is a bunch of interesting material in the book. I developed at least 3 different research ideas for further reading in the future along with extra material cited in the book for those research areas. I would recommend you read this book, and I’ll be purchasing a hard cover copy of it shortly after I return my library copy.